I've literally talked about the cooler weather that October brings non-stop since mid-August. We've had a couple tastes of 70 degree temperatures, and I figure if I keep talking about them that I'll wish more similar days into existence. Let's all do a "cool weather dance" to see if we can convince mother nature to be more benevolent. Tipitina's Rhythm & Blues 5K (Saturday, September 28th @ 5:00pm) - While the race is technically in September (just barely), I think it bears repeating that registration is still open on race day for this 5K. As you may be able to tell from previous posts, I'm a huge fan of NOTC races of late and this one benefits a great cause. You'll thank me come Mardi Gras when you dance to area high school bands playing instruments funded by the Tipitina's Foundation. Monster Dash 5K (Friday, October 11th @ 6:00pm) - Benefitting the Cystic Fibrosis Foundation, this race features a costume contest and fun run along River Road in Jefferson Parish. 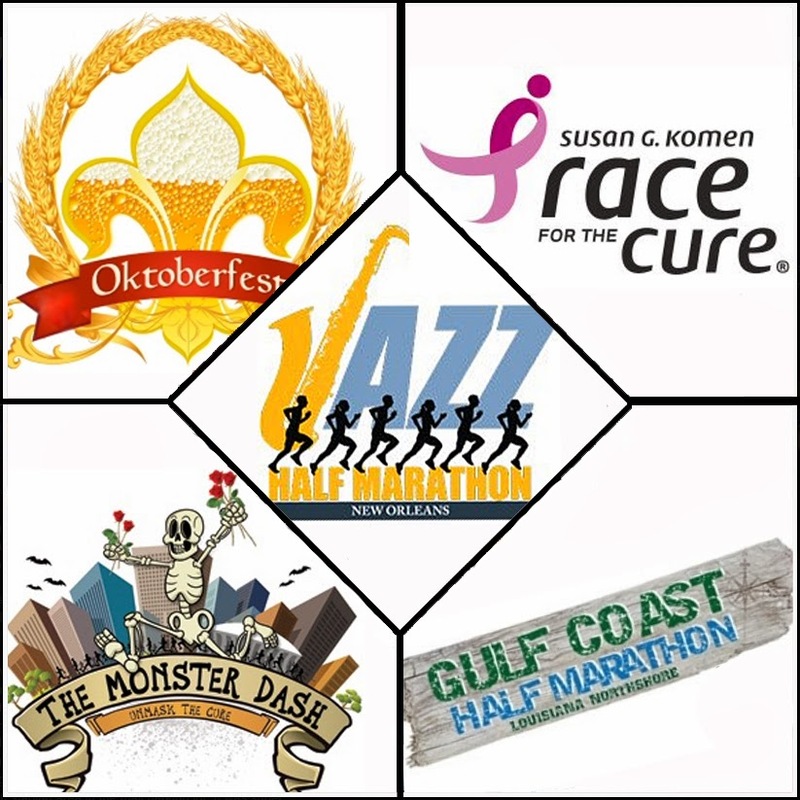 Jazz Half Marathon & 5K (Saturday, October 12th @ 7:00am) - Having run the first four years of this event, the fifth anniversary race in 2013 will be a highlight of my fall racing season. Runners trek up and down St. Charles Avenue and the route includes Audubon Park's running track in the scenery highlights. Family and friends have plenty of opportunity to show on course support with the out and back loop, however the finish line is televised locally on WDSU Channel 6. The beneficiary of the race is Children's Hospital. Read my review of last year's Jazz Half HERE. Warrior Dash Louisiana (Saturday, October 12th @ 9:00am) - LSU takes on Florida in Death Valley on the same day as this race, which will be held just a few miles up the road in St. Francisville, Louisiana. If you're headed to the race, plan accordingly for traffic through Baton Rouge. After the race, stop for tailgating and football in Tigertown. Spartan Race (Saturday, October 19th @ 8:00am) - The closest the Spartan Race series will come to Louisiana in 2013 is Kiln, Mississippi. Unlike other mud runs, this race series is more physically demanding and not for the faint of heart. Baton Rouge Beach 10K (Saturday, October 19th @ 8:00am) - An inaugural race for the irreverent Running Chicken Track Club will be introduced with this 10K. Unless you went to LSU or lived in Baton Rouge, not many people know there's a beach at "The Lakes." The same organization has put on a marathon in the same location the past 20 years, and always ends every race with a great party. Oktoberfest Race 5K (Saturday, October 19th @ 5:00pm) - Race registration includes free entry into the Rivertown Oktoberfest Festival for three weekends, plus three beers from the festival's full selection. Registration fees are super affordable for this race, and it's a great excuse to wear lederhosen while running. Gulf Coast Half Marathon (Sunday, October 20th @ 7:00am) - As part of the Gulf Coast Half Marathon series, the 2013 Covington race is a week later than the traditional date. This will be my first year of participation, and I look forward to getting to check out the scenic route on the shores of Lake Pontchartain. They just announced yesterday that in addition to the half marathon, there will be a 10 mile distance offered. Race for the Cure 5K & 1 Mile (Saturday, October 26th @ 8:00am) - One of the largest 5K races in the NOLA area, the Race for the Cure raises funds for the Susan G. Komen for the Cure breast cancer research foundation. Survivors are recognized pre-race in a ceremony in City Park, with the subsequent 5K taking runners along the shores of Bayou St. John. It's an all morning family event with tons of local vendors and groups showing support for the worthwhile cause. Which of these races will you be tackling, or are there others I'm missing? Any goals in mind as you enter October? NOLA is a hotbed for races every weekend. I am so jealous. Glad I will be there for Tipitina's Rhythm & Blues 5K!!! I'm glad you're here too! Going for your 5K PR will be fun! Would love to do the Gulf Coast half or the 10 mile option. However their packet pick up options are not convenient. Work too late to make it to the NOLA pick up and don't really want to drive all the way out to Mandeville and back the day before I do that for the race. Why not just have a packet pick up race day? I didn't realize that there was no day-of packet pickup. I assume it's to cut down on race day hassle on-site and to drive traffic in to the presenting sponsor's stores. But yes, that does create a barrier to entry. Sad to see that will keep you from racing.